Christmas markets, whilst a relatively modern import from Germany, are fast becoming an institution of the British winter season. Who doesn’t enjoy sipping mulled wine under the bright lights whilst wrapped up from the cold in a woolly hat and scarf? All across the UK, there are Christmas markets to choose from this November and December. Some of these are well known, such as Manchester or Edinburgh, but don’t forget the lesser-known spots who really know how to get you in the festive spirit. To help you on your Christmassy quest for market-perfection, here are Snaptrip’s favourite Christmas market towns. Winchester Cathedral in Hampshire provides a stunning backdrop for its Christmas Market, which is complete with an ice rink that is open whatever the weather. Each year thousands of visitors come to explore the pretty wooden chalets and the unique gifts and treats that are on offer inside. Bath’s award-winning Christmas Market is a shopper’s paradise, with over 180 individual chalets offering all sorts of interesting gift ideas for friends and families. The market lines the streets surround the Roman Baths and Bath Abbey, making it a beautiful choice for couples and friends alike. The Ludlow Medieval Christmas Fayre is exactly what you would want from a festive celebration. Held within the grounds of the town’s illustrious castle, the weekend market features amazing food and drink as well as an array of medieval entertainment to keep the whole family happy. With its beautiful buildings, rich history and prestige, one could argue that Oxford is a magical place throughout the year. The city is on top form during the Christmas market season, as the historic backdrop is lit up with colourful decorations, the irresistible aroma of mulled wine and cinnamon and the familiar sounds of Christmas carols. Lincoln’s Christmas market has grown dramatically in recent years, and now boasts over 200 stalls nested within its medieval square. A city which traces its ancestry back over 2,000 years, Lincoln’s Christmas market is a traditional affair located between the impressive Norman castle and the spectacular gothic cathedral. Manchester really embraces the festive spirit with markets making an appearance across the city. There are over 300 stalls offering food from across the world, drinks and a selection of festive presents. If you’re seeking present inspiration you are sure to find something for your nearest and dearest here. Salisbury market can be found in Guildhall Square and is home to award-winning exhibitors. At this charming market, you will be able to find delicious festive food and drink, as well as beautifully crafted items. If that’s not enough to entice you, there will also be live music, carol singing, and a lantern parade. Swansea City Centre hosts over 40 traders at their Christmas market, giving you plenty of goodies to choose from. From trying local specialities to enjoying a classically festive mulled wine or picking out beautiful presents; Swansea is full of Christmassy delights. If you have kids be sure to bring them along, Santa will be there at the grotto. Over 70 wooden chalets pop up in the centre of Chester, bringing merriment and festive cheer to the town. There will be a range of food, drink and gifts on offer; so you can treat yourself and your loved ones while getting in the Christmas spirit. There is also a grand Christmas tree at the centre, not to be missed. The Bury St. Edmunds Christmas Fayre is a spectacle not to be missed. Here you’ll find over 300 stalls across the town with delicious food, drinks and gifts. If that isn’t enough there are also plenty of events and entertainment; from fireworks to a fun fair. Derbyshire hosts a wonderful Christmas market; home to a beautiful selection of goodies that will make perfect presents for your nearest and dearest. If you get peckish don’t worry, there is a delectable selection of edible treats as well as a popup tea room. A trip to the Derbyshire Christmas market is sure to get you in the festive spirit. The Christmas market in Billericay, Essex has festive fun for all the family. For the kids, there is a Santa Parade, fairground rides and a circus troupe. There will also be over 150 stalls, where you will be able to find food, drinks, crafts and clothing. It’s brilliant fun for all the family, and a great way to kick-start your Christmas shopping. The Christmas market in Cardiff is sure to put you in a festive spirit as you stroll among the wooden huts selling all manner of food, drinks and crafts. There’s a wide selection of items on offer, so you’re sure to find some goodies for the family here. There is also food to take home and share, as well as hot food to enjoy while you’re out. Edinburgh’s market at East Princes St Gardens is a winter speciality. 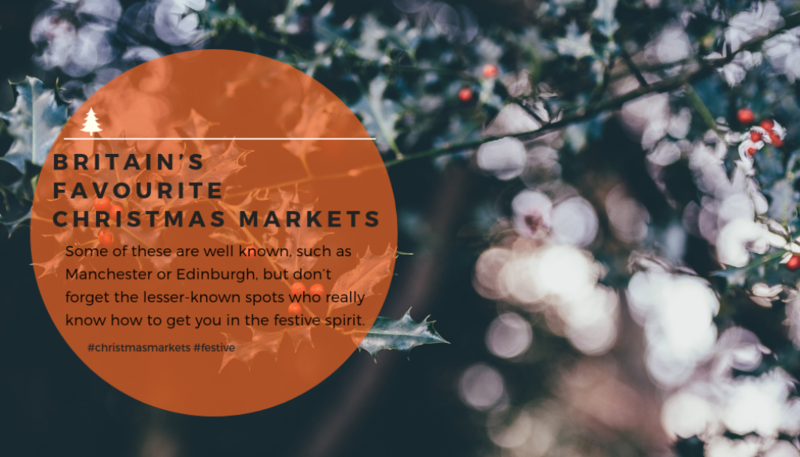 This traditional market is a gem at the centre of Edinburgh and has a brilliant offering of crafts and treats. You’re sure to find some delicious refreshments and Christmas presents for your loved ones here.